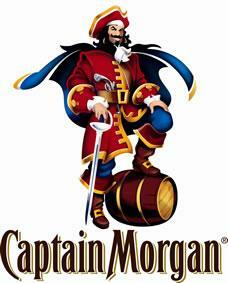 This is the face of Captain Morgan. And the face of Captain Morgan wants you to take life less seriously. Because look at him. He's a cartoon pirate. He's a big, grinning cartoon pirate named Captain Morgan. Who cares if you can't dance? Who cares if you can't hit the high notes? Who cares who cares? Get off the couch. Take life by the mechanical bull horns. Go make fun where there's no fun to be had. Go Full Captain. "Original Spiced - Mellow aged and enhanced with fruit flavors, spices, and a hint of vanilla. 70 proof"
"Ready-to-serve Long Island Iced Tea from Captain Morgan. Refreshing mix made with Rum, Vodka, Tequila, Gin and Triple Sec." " Original Spiced - Mellow aged and enhanced with fruit flavors, spices, and a hint of vanilla. 70 proof"
"PET - Mellow aged and enhanced with fruit flavors, spices, and a hint of vanilla. 70 proof"
"Private Stock 80 proof. - Rich, dark and full-bodied, blends hints of island spices with a smooth texture." "Tattoo - An extra-dark rum with fruit flavors described as berry or citrus 70 proof." "The most recent addition to the Captain Morgan family boasting the highest alcoholic content of the Captain Morgan line of drinks. Closest relation is Captain Morgan's Original Spiced Rum, but with an added kick."